Use the latest information in GoldMine CRM to send and manage email campaigns without the need to upload or refresh your data anywhere else. IntelliClick For GoldMine provides seemless integration and a simple way to send email campaigns to your target audience. Capture open, click and web page navigation behavior and engage your sales team with timely email and/or text message alerts. Complete analytics are provided through built-in dashboards and reports to measure response rates and summarize opportunities. Tightly integrated inbound marketing and anonymous web visitor tracking is now available for GoldMine CRM. This capability can be used on its own or to enhance your IntelliClick email marketing campaigns. Either way, results are stored in your database in real time! 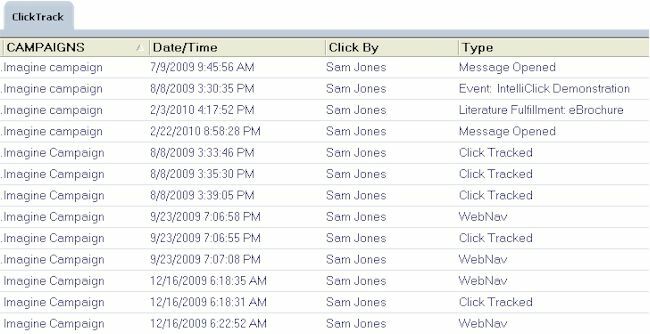 Existing or new forms on your web site instantly add contacts to GoldMine with a complete summary of their prior anonymous page browsing history. Details of referring sources are tracked and reported (i.e. organic search, social media, pay-per-click, etc.). Lead follow-up and drip marketing can be triggered using GoldMine's built-in workflow automation capabilities. A special web site page navigation feature adds to the power of your email campaigns. Benefit from "digital body language" to prioritize opportunities based upon browsing behavior from each of your campaigns. View our video tutorial to learn more about this powerful feature of IntelliClick. The IntelliClick Hyperlink Building Wizard streamlines the preparation of the email template and special hyperlinks. Each link has intelligence tied specifically to the campaign and the web page to which the recipient is directed. Options for "one click" call to action links to send literature or register for enhance your campaigns with interactive response. Email and text message alerts notify your sales team focused on timely opportunities. 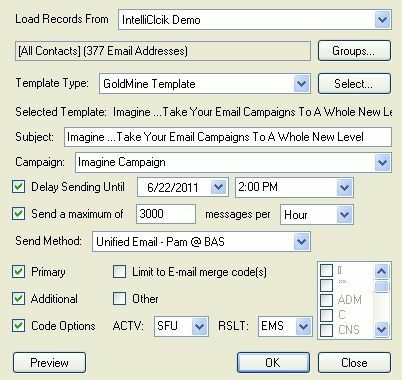 The IntelliSend module provides a simple and streamlined screen for GoldMine users to assemble their mass emailing. Email addresses that are flagged as either unsubscribe or undeliverable (hard bounce) from past mailings are automatically excluded as the job is assembled. Scheduling and setting of email volume limits help to control campaign delivery as desired. IntelliSend allows the types of contacts in GoldMine to be included, as well as the use of email merge codes (if desired) to further isolate the target audience. 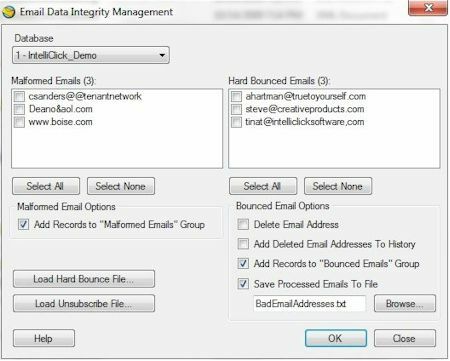 IntelliSend provides easy to use bounce management functionality to maintain the integrity of the email addresses stored in your GoldMine database. Hard bounce undeliverable messages returned to the GoldMine inbox can be monitored and action taken to update records needing attention. Removal of bad emails can also be automated with a copy of invalid emails stored in GoldMine history for future reference. Monitor and measure customer engagement, and trigger actions as you receive response to your IntelliClick managed email campaigns. As results are tracked to your GoldMine system, the scoring module keeps a tally of opens, clicks, web page visits and overall total, helping identify the best lead opportunities. Trigger GoldMine automated processes to send drip marketing campaigns and timely follow-up actions to your sales team as score thresholds are reached. GoldMine dashboards and reports summarize the details of your campaign click track activity, breaking down each campaign and providing metrics to determine which are most effective. Real time information is available on demand or you can have it automatically delivered by email at time intervals and to recipients you designate. View details by campaign, by web page accessed, and by date and time; with specifics about those who access your pages. Summaries across all your campaigns provide a snapshot and measurement for any time period you wish to measure. Go "beyond the click" and see all pages your email recipient visits on your web site. Even if they return days, weeks or months later, you will see what they are looking at, instantly integrated to their contact record. One Click "Call To Action"
Use our one click options to instantly send literature or all email recipients to request follow-up action. Automation provided by IntelliClick instantly handles these responses and makes it easy to keep your audience engaged. IntelliClick offers several ways to allow your recipients to opt-in to specific types of mailings. This encourages them to stay on your mailing list and helps you better target your audience. Results of your email campaigns are added to GoldMine instantly. Get a complete picture of your recipient interests as they react and alert your sales team for timely follow-up. Convert anonymous web site visitors to leads and capture the pages they viewed while browsing anonymously. Measure which referring sources are delivering the best ROI.